Foreigners can easily rent or buy motorbikes in Vietnam but many of them do not know the country’s traffic laws and traffic police find it difficult to punish them because of language barriers. Vietnam’s laws regulate that for a foreigner to drive a motorbike in the country, they must be above 18 years old, allowed to live in the country and have a valid driving license. But foreigners can hire motorbikes easily without fulfilling the above conditions. In the centre of HCM City, many shops advertise motorbikes for rent from VND100,000-200,000 (US$4.4-8.8) per day depending on the kind of motorbikes. The owner of a shop in District 1 said that to hire a motorbike, a foreigner only needed to give his/her passport, or some money as a deposit. 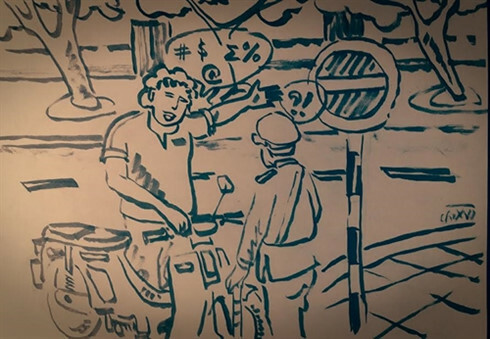 Tuoi tre (Youth) newspaper’s correspondent found that near the Tan Son Nhat International Airport, there are many shops offering motorbikes for hire. Most of their customers are foreigners. In Nha Trang City in the central province of Khanh Hoa, there are a number of similar shops in main streets such as Biet Thu, Nguyen Thien Thuat and Tran Phu. The shops advertise their services in Vietnamese, English, Russian and Chinese with the prices of VND150,000-250,000 (US$6.6-11) per motorbike per day. Lawyer Huynh Van Nong said that a foreigner violating the Law on Transport should be fined like Vietnamese people. If the violator and traffic police did not have a common language, or the violators do not obey the traffic police, the police could still punish them. Nong said that foreigners could change driving licenses from their country to Vietnam’s driving licenses, and the procedure was simple and clear. Lawyer Vu Manh Quynh said that for foreigners from countries driving on the left hand-side such as the UK, Singapore and Australia, they could be asked to take a theory test when they want to change their driving licenses in Vietnam. At present, procedures to let foreigners hire motorbikes in the country were basic, said Quynh. In some developed countries, the work was more professional. The hirer must show his/her driving license, credit card, passport and must buy insurance, he said. Infrastructure and signs system in Vietnam is quite different from international norms, for instance, urban traffic signs are often hidden by billboards of shops and restaurants. Lawyer Quynh proposed the Government refer to regulations of other countries such as Germany about the motorbike owner’s responsibility in punishing traffic violations. Nguyen Van Canh, head of the Khanh Hoa Traffic Police Department, admitted that some traffic police were embarrassed to punish foreigners for violating traffic laws because of their limited ability to speak foreign languages. Paula Bianca, a tourist who often visits Vietnam, said she was fined by traffic police two months ago in Hanoi for driving in the wrong direction. “The police could not speak to me in English, he used body language to express that I violated traffic laws,” she said. Paula had to pay US$20 for the violation. Huynh Trung Phong, deputy head of the HCM City Traffic Police Department, said that the department set up teams with workers good at foreign languages to punish foreigners violating traffic laws. The punishment would go together with education and guidance to help them understand the regulations, he said. Colonel Dao Vinh Thang, head of the Hanoi Traffic Police Department, told the Tuoi tre (Youth) newspaper that recently some foreigners did not wear helmets while driving motorbikes, and the city police would give strict punishment to them. But the traffic police would be flexible. For instance, when foreigners said that they went to Vietnam as tourists so they did not know the laws, traffic police will give them a warning only, said Thang.